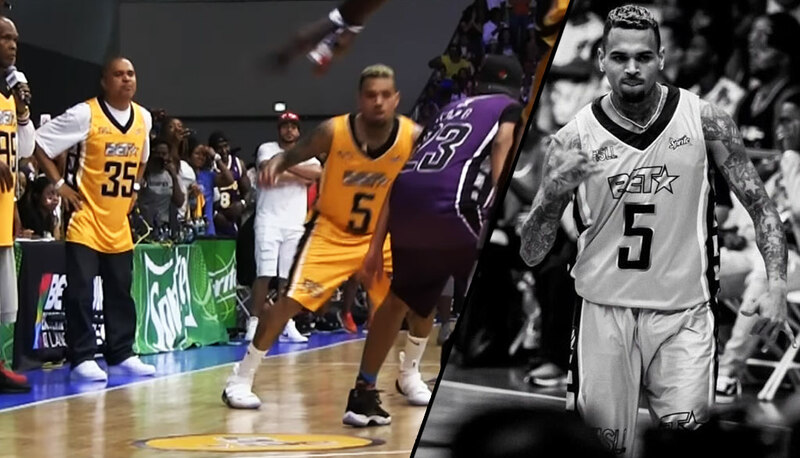 He didn’t break any ankles like he usually does in celebrity games but Chris Brown was named Co-MVP of the 5th annual BET Celebrity game on Saturday after knocking down a dagger three over rapper Kap G and blocking a shot during the final seconds of a wild and controversial finish. Down by five, the opposing team — coached by rapper and former Rucker Park Champion coach Fat Joe — had one last shot at forcing OT since the court had five-point circles. Pro dunker Carlos Smothers (What’s up Los!) connected on a shot from one of the circles at the buzzer but upon review and a lot of yelling by coach Irv Gotti, was changed to a three. Other celebs in the game included rapper The Game (co-MVP), rap legend Mase (who was nice in high school along with teammate Cam’ron), Trevor Jackson, Young M.A and former NBA player Doug Christie.